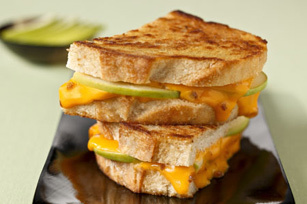 Sugared Ink: Yummy Bacon Cheddar Melt + Hellman's Sweepstakes! Yummy Bacon Cheddar Melt + Hellman's Sweepstakes! Okay - so we have discovered this really yummy sandwich in our house! It is super simple to make and my husband died over how good it was, and he's a chef so it's hard to impress him! Just take a slice of sourdough bread and top it with a slice of cheddar cheese, then 1 strip of cooked bacon (microwave ready ones, if you really want to cut down on prep time), the 4 thin slices of apples, 1 more strip of bacon, and another slice of cheddar cheese. Then top it off with another slice of sourdough. Spread the outside of the sandwich with Hellmann's Mayonnaise and grill it up on a skillet over minute heat for a few minutes on each side. If you need to get your cheese a little more melty, (is that a word?) just pop it in the oven for a minute. My kids even love this sandwich. Did you know that 33 percent of Americans who eat sandwiches credit their mom with teaching them how to make a great sandwich? Nearly three-quarters of moms with sandwich-loving kids say the serve their families the favorites they ate growing up! With that, I want to give you an opportunity to win a $5000 grocery giftcard by entering the Hellmann's® Build Your Perfect Sandwich Sweepstakes! All you have to do is pop over here to enter: Facebook.com/hellmanns - happy sandwich building! "Disclosure: I was entered for a chance to win a Hellmann's® prize package in exchange for this post. No monetary exchange took place."